Contrary to popular belief, not all Corydoras are tropical fish. Indeed, two of the most common species in then hobby, the peppered cory Corydoras paleatus and the bronze cory Corydoras aeneus, are in fact subtropical fishes. 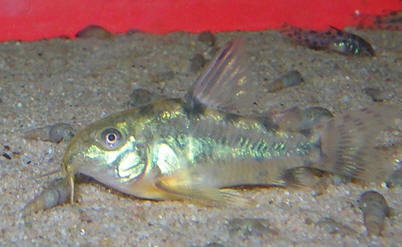 Wild peppered Corydoras in northern Argentina will be exposed to water temperatures well below 10 degrees C (below 50 degrees F). After chatting with some knowledgeable catfish people, it became clear to me that the commercially bred peppered Corydoras are not that different to their wild ancestors. So last year I decided to try keeping a school of peppered Corydoras in my small garden pond. At this point, I should perhaps describe my pond. It's very 'low tech', basically a large plastic barrel-shaped structure containing a few tens of gallons. The bottom is covered with sand and a bit of aquatic soil, and the whole pond is thickly planted with things like Acorus, hornwort, hairgrass, and, in summer, various cuttings taken from my aquarium. Aquarium plants do remarkably well in garden ponds over the summer, growing rapidly and sometimes flowering. While the pond isn't filtered, water quality is excellent, with no nitrite or ammonia and virtually no nitrate either. Plants, when growing rapidly under sunlight, are prodigious consumers of nitrogenous wastes, something we don't always appreciate when the same plants are kept in aquaria. Part of this is because tanks tend to be more densely stocked than ponds, but a major factor is that plant growth under ordinary sunlight is much more rapid than under the relatively weak lighting provided by fluorescent tubes. 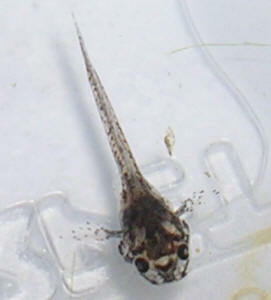 Feeding on algae and decaying plant material in the pond are any number of invertebrate species. At last count, I've spotted not just the snails and daphnia you might expect, but also planarians, leeches, hydra, ostracods, freshwater shrimps (Asellus spp. ), tubifex worms, and insect larvae. Decaying plant matter'¦? Algae'¦? Small invertebrates'¦? Sounds like the perfect Corydoras buffet to me! So when June rolled into July and the weather kept above 15 degrees C (69 degrees F) out the catfish went. The catfish settled in fine, almost at once rooting about in the mud for food. I admit to adding a few catfish pellets once or twice a week, if I remembered, but otherwise they were eating from Nature's table. What we don't always see when these fish are kept in clean aquaria is the extent to which they process mud when foraging. In a pond, it's fun to watch them swallow mouthfuls of mud and then spew it out through the gills. Presumably algae, organic detritus, and the small animals are captured in the process by the filter-like gill rakers and then swallowed. Whatever they were feeding on, they seemed to wax fat on it. It is also easier to watch their schooling behaviour in the relatively open spaces in a pond compared with the more cluttered and overcrowded environs of the tropical aquarium. Nose to tail, the little swarm of catfish would dash away from any shadows over the pond, in their minds at least avoiding the herons and other predators to which their ancestors might fall prey. By September, I decided it was time to bring the catfish inside. The nights were getting chilly again, and I didn't want to take the chance of harming the fish by exposing them to too much cold. After an hour or so in a bucket containing a mix of pond water and aquarium water, they were acclimated back to my aquarium temperature and water chemistry. Next morning, as the sunlight shone across the patio door and onto the aquarium, my catfish started spawning! Little white eggs were being laid in clutches all over the tank. I'd never seen Corydoras spawning before, and watching their rather elaborate egg-laying behaviour was a real treat. Unfortunately, the eggs were being scattered about a busy community tank. In my ignorance of catfish breeding, I didn't know that if you want to move catfish eggs, you need to wait for a day or so, to allow them to harden up. As it is, between my squishing the eggs when trying to move them and the other fishes simply eating them, nothing survived from the first breeding event. Slightly more problematic was that my South American pufferfishes had decided that Corydoras dorsal fins were the dish of the day. So I decided to move the Corydoras to a 10-gallon tank where I was rearing some halfbeak fry. At this point, I wasn't planning on breeding the catfish but only on finding them somewhere safe to live. The halfbeak fry were too mobile to be at risk of being eaten by the catfish, so the combination seemed sensible. The tank was situated on what is essentially a ledge by a kitchen window, and for a couple of hours each morning it receives a lot of sunshine. Early one morning I went into the kitchen and saw the catfish spawning vigourously. Whatever else, their summer sojourn outside had brought them into peak condition! Again, morning sunshine seemed to be the spawning trigger. Unfortunately, the catfish weren't the only things brought into the house from the garden pond. I had been bringing in daphnia from the pond every day to feed the baby halfbeaks, and in some batches were some small pond snails. I hadn't given these much thought at the time, but it quickly became clear that the snails were eating some of the Corydoras eggs! Of course, I couldn't be entirely sure that the Corydoras weren't taking a few eggs either, so the Corydoras were moved to yet another tank and the snails were all turned into pufferfish food. About four days later, I decided to move as many eggs to a floating plastic cup with some holes drilled in it so that I could keep them safe from any snails I'd missed. I'd read that the eggs were easier to roll off the glass after a few days, and this indeed proved to be the case. But while I was moving the eggs, they started to hatch! So instead of moving eggs, I was scooping up fry. After a couple of hours of excitement I had managed to collect all the eggs and fry I could seen, and ended up with about fifteen little wrigglers. So far, so good. The following day the fry seemed healthy enough and had used up their yolk reserves. One great thing about having a pond is that collecting small animals, algae, and infusoria for baby fish is a breeze. All you need to do is squeeze some hair algae into a plastic pot and in no time you'll have lots of little goodies for your baby fish. The Corydoras fry responded at once, thriving on a mix of pond life and Hikari 'First Bites' baby fish food. They visibly grew from one day to the next. In the meantime I also discovered that I had missed quite a few hatchlings, and these were swimming about the tank outside my home-made breeding trap. So far as I could tell, they were doing at least as well foraging on the algae and tiny animals resident in the sand at the bottom of the tank. So I decided to release the baby fish from the trap, and let them forage in the tank with their siblings. Bad move. As the days passed, I noticed that although the baby were growing rapidly without me adding much food to the tank, there also seemed to be a drop in the number of fry visible at any one time. What was happening? Only eventually did it become clear: nocturnal flatworms were attacking them! Somehow, these worms were climbing onto the tiny catfish and eating the skin or mucous layer. This seemed to be causing secondary infections, and once that happened, the fish died. So out came the forceps, and the tank was scoured for flatworms. By the end I'd managed to clean the tank thoroughly, I'd managed to rescue around twenty fry. These seemed to do well, but what was interesting was that while some fish grew rapidly, others grew much more slowly. After a couple of months, some fish in the brood were as much as 20 mm long and basically miniature versions of their parents. But others were barely half that size and still looked like fry. Some of the weaker fry simply died no matter what, as if they were the runts of the litter. Was that a water quality issue? Or did their big siblings out-compete them for food? This did seem to be at least one possible factor, because removing the biggest Corydoras to the same tank as their parents resulting in the remaining fry growing a bit more quickly. 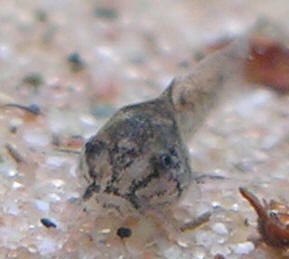 There's no mystery to breeding the peppered catfish Corydoras paleatus. In fact, they're among the easiest egg-laying fish to breed. But my experiment here does raise a few interesting points that could be useful to people who either haven't had any luck breeding catfish at all, or are trying to spawn a species that isn't routinely bred in captivity. Firstly, in keeping with subtropical rather than tropical origins, my Corydoras paleatus did extremely well in a garden pond over the summer. Whether it was the more natural variations in temperature and day-length, or the wider range of foods (including algae and decaying plant material) that helped, the result was healthy, well-condition catfish eager to spawn. Secondly, the combination of a rise in temperature as well as morning sunshine seemed to act as spawning triggers. Thirdly, the use of a breeding tank in which 'pond foods' have been placed has distinct pluses and minuses. On the credit side of the equation, the abundance of algae and small animals provided the newly hatched catfish with a useful first food. There was no need to rear baby brine shrimp. 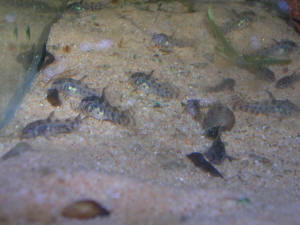 The fry were largely left to forage for themselves, and they seemed to grow quickly. But on the debit side, snails and flatworms clearly posed a risk to eggs and small fry. By contrast, a clean tank without a substrate means you will have to provide small live foods to the newly hatched catfish four to six times per day. The advantage to this approach is of course that you have a much easier time keeping the aquarium clean and don't run the risk of losing eggs or fry to flatworms and snails. 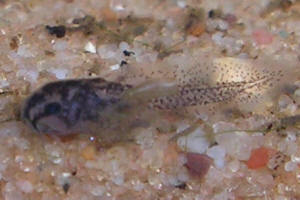 All in all, Corydoras paleatus strikes me as an excellent species for the aquarist who wants to try breeding egg layers. I was pleasantly surprised by how easy the fry were to rear. Hitherto, my breeding efforts had been concentrated on livebearers and cichlids. Cichlids are of course egg layers, but because the parent fish take care of things like keeping the eggs and fry clean and removing potential predators from the nest, rearing cichlid fry is pretty much a case of sit back and watch. Even feeding cichlid fry is comparatively easy, partly because cichlid fry tend to be large, and partly because the parents often lead the fry to suitable patches of algae or chew up food and spit out more manageably-sized particles at their offspring. 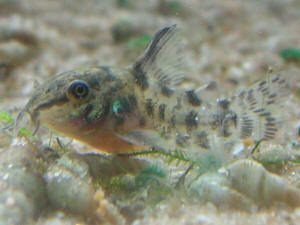 Peppered catfish are different, since the parents take no part in protecting the eggs or fry. The fry are very small and consequently vulnerable to wide variety of hazards. But it's worth the effort. 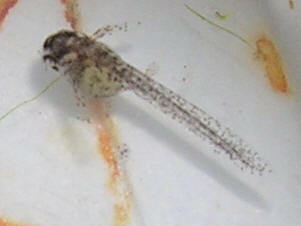 Watching baby egg laying fish develop is rather different to rearing a brood of livebearing fish such as guppies. 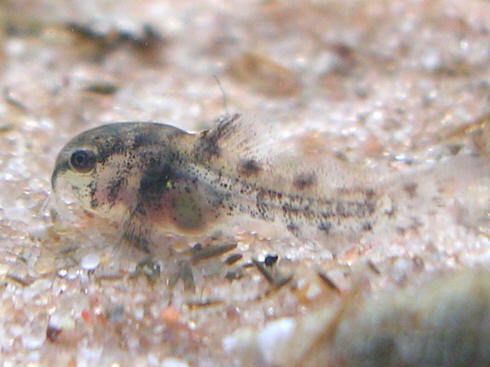 Baby livebearers are essentially miniature versions of their parents and able to eat similar foods from day one, and provided they aren't eaten by other fish in the tank, there's nothing much that can go wrong. Newly-hatched egg-layer fry, on the other hand, are little scraps of life, barely resembling their parents at all. Watching their fins, whiskers, and colour patterns develop was fascinating, and something that would appeal to even the most jaded aquarist!